The 1650s saw the end of 12 years of warfare with the victory of Cromwell’s forces in Ireland. The cost: Irish Catholics lost their land, which was given to English “adventurers” (investors and entrepreneurs) and English soldiers. To accomplish the task of re-distribution of land on such a massive scale, the Down Survey was undertaken. It measured all Catholic lands being confiscated throughout the whole of Ireland. There are two main components to this Trinity College website. The Down Survey Maps section comprises digital images of all the surviving Down Survey maps at parish, barony and county level. The written descriptions (terrier) of each barony and parish that accompanied the original maps have also been included. 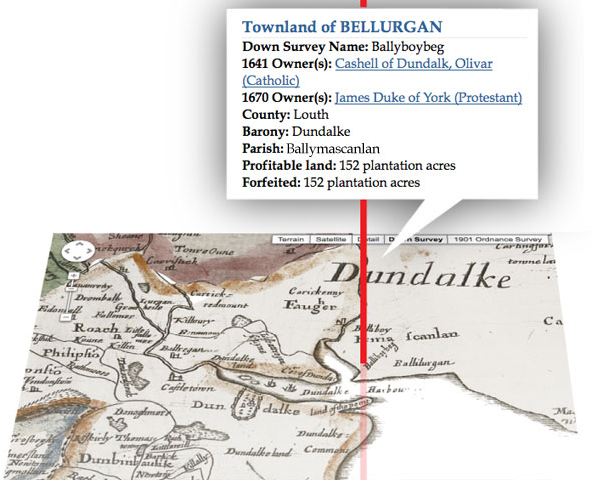 The second section, Historical GIS, brings together the maps and related contemporaneous sources – Books of Survey and Distribution, the 1641 Depositions, the 1659 Census – in a Geographical Information System (GIS). All these sources have been geo-referenced with 19th-century Ordnance Survey maps, Google Maps and satellite imagery. This makes it possible to find the original land owner and location, as well as the name of the owner after the redistribution of the land. Thanks to Deborah Large Fox and Mary Catherine Moran who passed along this information.